For the race skating loving kid, the Rollerblade Powerblade Jr is a premium speed that they are sure to love. From the heat moldable boot for a custom fit to the versatile frames, young racers will not be disappointed. Racing is all about having the fastest skate possible but aside from the wheels, the key component are the boots and fit. If they do not fit correctly, the skating technique is compromised. Just follow the simple instructions included with the skates and the heat molded skates will feel like the wheels and frames were mounted directly to the soles of the feet. The Rollerblade Powerblade Jr have been carefully selected. 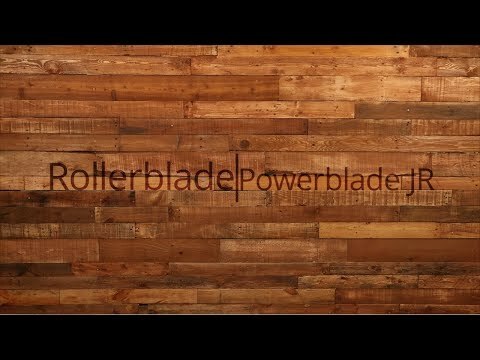 These skates feature the Supreme wheels and Twincam bearings that help push the skates performance to roll further and faster in the Powerblade Jr.
Q: I want to buy these skates for myself, and I'm women's US size-8.5-9 would they still fit me if I get JR 6.5size? A: It depends on how tight of a fit you are looking for, the size 6.5 junior is going to be a 24.5 cm which equates to a size 7.5 women's shoe size so if you wear a 8.5-9 you're looking at a full size down. The 6.5 junior will more than likely be too tight. Q: I cannot decide which size should be ordered for my little 6-year old girl. Her feet's length is 19.5cm. Is this model right for her. If so, which one? A: The smallest size the Rollerblade Powerblade Jr comes in is the size US 1.0 which is equivalent to a size 20.5cm. So the size is going to be roughly 1 full size too large and this is the smallest size that this skate is available in.